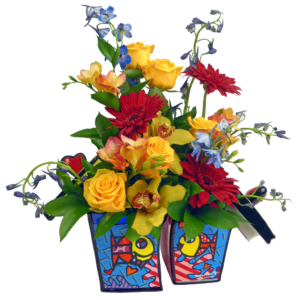 Flowers | Flower Delivery | Send Flowers | Karin's Florist | Our Blog | Blog | Fall in love with Britto! Karin’s Florist is pleased to introduce our new product line: artistic keepsakes and containers from Romero Britto. ROMERO BRITTO creates a completely new expression that reflects his optimistic faith in the world around him. Alluding to influences of early and modern masters, Britto’s pulsating colors, pop themes and commanding compositions have led him to become the premier contemporary Artist of his generation. ROMERO BRITTO moved from Brazil to the United States where Pop Art was flourishing. Britto moved to Miami and set up a studio open to the public. With an unshakable resolve and belief in his art, Britto spent the next few years exhibiting and attracting the attention of many. Then, in 1989, Absolut Vodka® selected Britto to design an artwork with their famous logo. Britto’s participation added his name to a list of Artists, such as Warhol and Haring, also commissioned for the famed vodka campaign. Britto’s studio in Miami Beach was quickly becoming known as the place for people of all ages and walks of life to meet and acquire a unique style of art. ROMERO BRITTO today is represented in galleries and museums across five continents. Opening in Paris at the Carrousel du Louvre, Salon Nationale des Beaux-Arts in December 2008, Britto unveiled “Journey” to hundreds of guests. Other unique artistic endeavors have flourished. “…Matisse channeling Picasso,” wrote the New York Times® when Britto created a living canvas performed by the Cirque du Soleil in celebration of Super Bowl XLI. And now, Karin’s Florist will offer a variety of limited edition collectibles that can be purchased by itself or, in some cases, a beautiful flower arrangement can be incorporated into the container to make a unique piece of art.